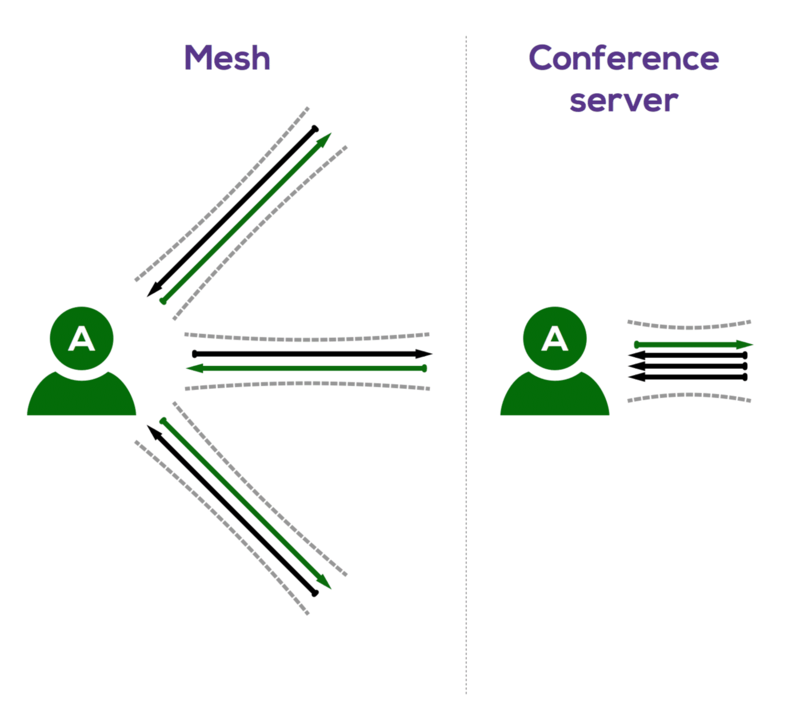 WebRTC is progressing rapidly; the main trend seems to be transitioning from peer-to-peer to conferences with centralized servers. This is occurring mainly for conferences with more than 5 participants. In a full-mesh video, every participant sends media to all other participants, i.e., if there are M participants, an endpoint sends M-1 media streams and receives M-1 media streams (shown in Fig 1) 1. In this case, each peerconnection carries media stream tracks corresponding to the audio, camera, screen, and data between the pair of participants. Alternatively, when using a conferencing server a participant sends its media stream to the conference server and receives media streams from the conference server and not the individual participants. Hence, an endpoint sends 1 media stream and receives M-1 media streams (shown in Fig 2). Mapping this to WebRTC 1.0 terminology, an M participant conference will have M links 2. However, in this case, a single peer connection carries multiple incoming media streams corresponding to each participant. In our API, when setting up a peer connection, the developer specifies the localUserID and remoteUserID for the peerconnection (See addNewFabric()). The remoteUserID in a mesh topology is the remote participant’s userID (see Figure 3a). However, when interacting with the conference server, the developer is most likely going to use the name or identifier of the conference bridge as the remoteUserID, as it cannot use a particular remote user ID as they may be several. A typical conference bridge (for example, Jitsi Videobridge) transmits multiple media stream tracks within a peer connection (see figure 3b). Figure 3. Connections viewed by a single participant. Furthermore, correlating the received Synchronization Source Identifier (SSRC) with the SSRC generated by every participant for each media stream track may not work if the conferencing server rewrites the incoming SSRC. Therefore, making it difficult for the callstats.js to identify which incoming media stream belongs to which participant even though we might know the SSRCs generated by each endpoint. Figure 4. Associating userID with MST. / configurations of the individual MSTs). What is meant by a relayed conference call?